We are fortunate to get tender bhindi in our part of the world all through the year. And its a must buy vegetable on each visit to the Rythu Bazaar (Farmer’s Market). One of the best vegetarian recipe I have had in a long time is a stuffed okra with its origins in Gujarat. Tarla Dalal’s recipe for a Gujarati stuffed bhindi is simply out of the world. I am not exaggerating. 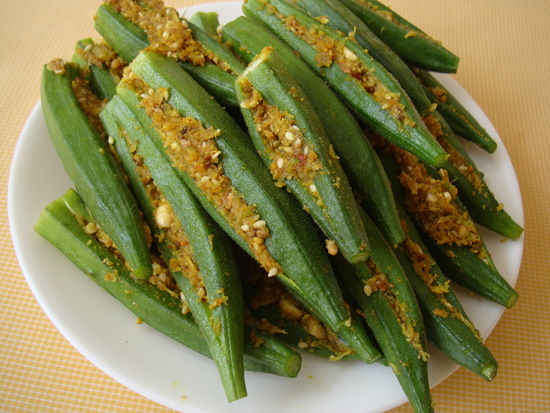 Those who hate okra will definitely fall in love with it when they try Bhindi Sambhariya. Be sure to use tender okra and add enough stuffing in each okra. Its all the in the stuffing. The combination of ingredients that go into the stuffing are extremely flavorful hence do not skimp of the quantity of stuffing used for each okra. 1 Mix all the ingredients meant for stuffing in a bowl. Keep aside. 3 Heat oil in a vessel. Once hot, add asafoetida and curry leaves and saute for few seconds. Add the stuffed okra and spread them around the vessel in a single layer. Add any left over stuffing and cook on low medium flame without lid. Every few minutes turn the okra to allow even cooking on all sides. Slow roasting of the okra can take at least 30 minutes. 4 Turn off heat. Serve with rice or roti. The receipe photo itself looks soooo mouth watering…hmmm…. will definitely try this weekend. The recipe sounds different and may be tasty. I am going to try it. When ever I need to fry I use electric skillet and it turns out great. Thanks for a new recipe. It looks yum. 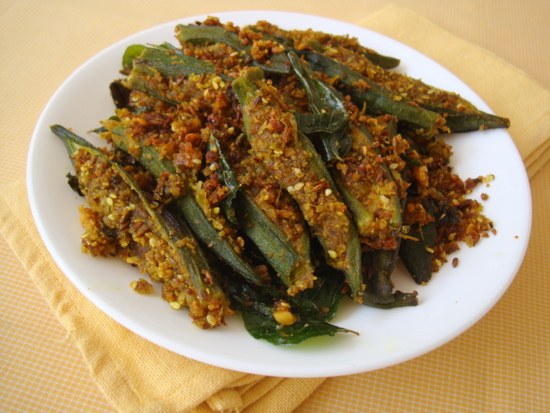 Since I don’t have bhindi at home, can I use the same stuffing with Karela or do I need to add anything else in order to reduce the taste of bitterness. You can de-seed the karela, place in a cup of buttermilk and 1/2 tsp turmeric powder for about 15 mts. Drain and follow rest of the procedure. I have not tried with bitter gourd. Do let us know how it turns out. The filling sounds so good, and no need to roast and grind! We’ll try this the next time bhindi is on the menu. thanks! Just makes me hungry, wat an incredible stuffed okras.. I have actually never tried making stuffed okra. This looks so so good. really its good, I never seen stuffed okra. I will try definitely. Thanks to sailu garu. I tried out your recipe of stuffed okras today. They were delicious … I never knew okras could taste that good. You were actually not exaggerating when you said that it was one of the best vegetarian recipes. really very delicious, i have tried n came out a winner recipe. thanx lot sailu garu..
very innovative and delicious recipe ……..
Hey, I’ve been following your recipes for sometime now and must say that your measurements are spot on… perfect taste! I tried this above recipe and it was so delicious…. I loved the taste of the stuffing, So, I did my own spin on it the second time. I mixed the stuffing as per your recipe and then I chopped up potatoes and then mixed them together and slow cooked it in a kadai. I must say it worked brilliantly with potatoes too. Thanks a ton and keep up the good work. Cheers! Wow, wow, wow… I’m going to make this soon! Hi Sailu, I made this bhindi fry tonite. Got super nostalgic, coz my mom used to make it just like you have the recipe. It turned out super!!!! Bhindi Sambhariya looks very yummy and tasty. it is very famous in gujarati dishes. i will try it soon. thnx for sharing with us. One of my favorite vegetable lady finger, but was unaware of this recipe. Wow that was the best bhindi I’ve ever had! Thank you! Hi, Do you use fried peanuts or raw peanuts? Sailaja garu! Ee recipe chala baga vacchindi. Nenu leta sanna bendakayalu teesukini, mottham kaya ki gatu petti stuff chesi, kayani veginchanu. simply out of this world!